When changing operating systems and migrating data, you might end up not being able to access some of your files or folders anymore. This can happen due to the fact that your user has lost ownership of those files & folders or it no longer has the required permissions. In this tutorial will try to address this type of issues and help our readers that reported having such problems. Even though the procedure is a bit long, you will see that things are not very complicated. 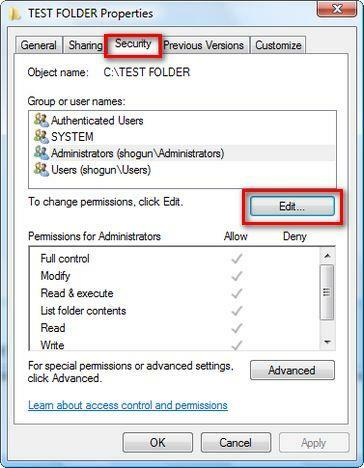 If you cannot open, delete or change a folder from your disk, it means that you either need to take ownership of that folder or/and you need to change your user's access rights. To make this kind of change your user needs to be an administrator. Both operations are done from the same menu. 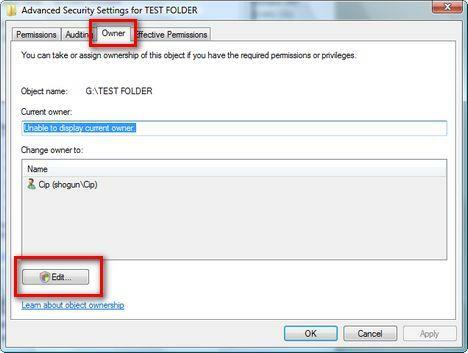 First, navigate to that specific folder, right click on it and select Properties. This should work in all Windows versions from Vista to Windows 10. In the Properties window go to the Security tab and click on Advanced. Now go to the Owner tab. Here you will see the current owner of that folder. If your user is not the owner, click on Edit. If you have User Account Control enabled, press on OK. In the Owner window, click on Other users or groups. 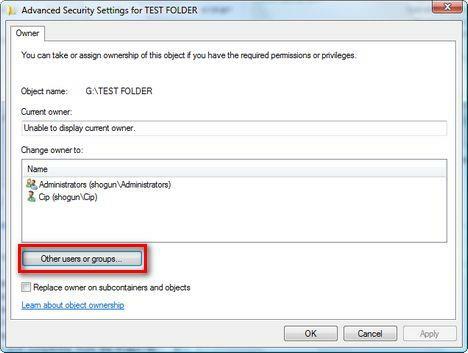 Now you need to type the user name or the group of users that will take ownership of the selected folder. 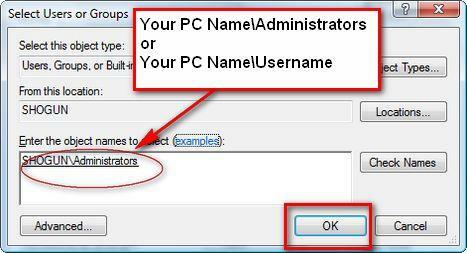 If you type "Administrators" you will give ownership to all the users that are administrators on your PC. If you want to give ownership only to your user, then type your user name. After that, press on Check Names. If the user or group was found on your computer, you will see that the text you typed was changed to [Your PC Name]\[User] or [Your PC Name]\[Group]. If so, press on OK. If the user/group was not found you will receive a Name Not Found error window. Make the necessary corrections and try again. 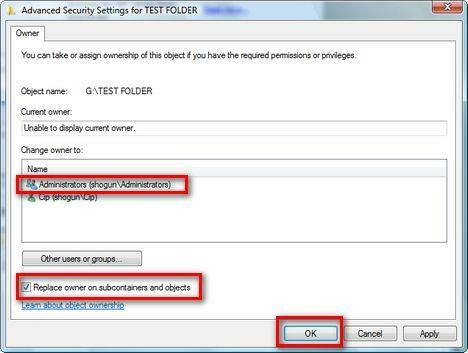 In the Owner window, select the user/group you just added, select Replace owner on subcontainers and objects and press OK.
Now you will receive the confirmation that you have taken ownership of the folder. Press on OK and that's it. In the Properties window go to the Security tab and click on Edit. If you are not on the list of users or groups that have permissions defined, you should click on Add. 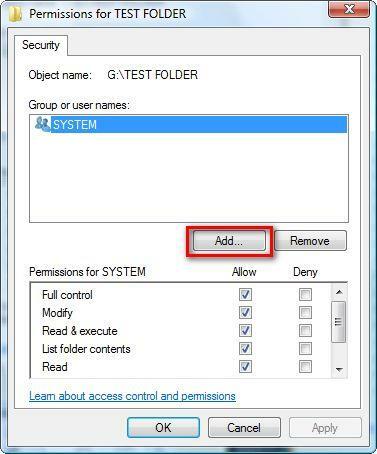 If your user or group is on that list, select it, click on Allow Full Control and then press OK.
Now you need to type the user name or the group of users for which you want to change the permissions. 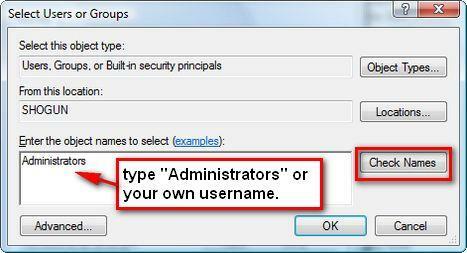 If you type "Administrators" you will give permissions to all the users that are administrators on your PC. If you want to give permissions only to your user, then type your user name. After that, press on Check Names and then on OK. 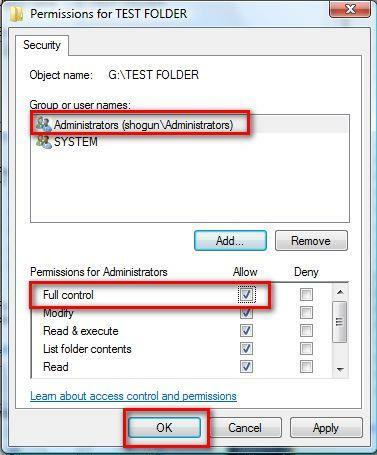 In the Security window, select the user/group you just added and then click on Allow Full Control. I followed this to the letter, but one file in the folder, I am unable to take ownership of. The crazy thing is, I copied this file from my PC to my notebook, and am the owner anyway. But now I can't move it, delete it, or do anything else with on my notebook. I had the same issue, tried everything, was unable to fix it. The final solution was that I down loaded a CD bootable Linux and did the copy via Linux. Works perfectly. You said .. "I copied this file from my PC to my notebook ..."
Cannot take ownership of the file, logged in as administrator. Can you describe the steps you made and the error messages you get? Try Googling "vista admin ownership" - you should get a solution from the top few results (different solutions for different problems). If you will go to the Microsoft Outlook website, there is a tool there that you can export your contacts and save to put into another place. place a check mark in the box at the bottom called "Replace owner on subcontainers and objects", then select the new Owner you want, and the click "Apply". You may get a few windows asking essentially "Have you lost your mind" and "Really, are you sure your smart enough to own files", but just click threw the MS Big Brother nonsense. A few files open in the C:\Windows\System32 may be denyed because the file is in use, but other than that you should get access to all of the folders on YOUR COMPUTER! Don't forget to next turn on all permissions for your new owner. I deny the permission to C drive. I made the mistake of connecting my portable hard drive to a friends Vista computer. i copied some folders and files to the drive. later on my XP Machine i tried to rename the the volume but was denied. I have no permission. when i checked file permission i was the owner. I had full control of hard drive. I finaly fix it by reformatting the drive. stupied Vista permissions. 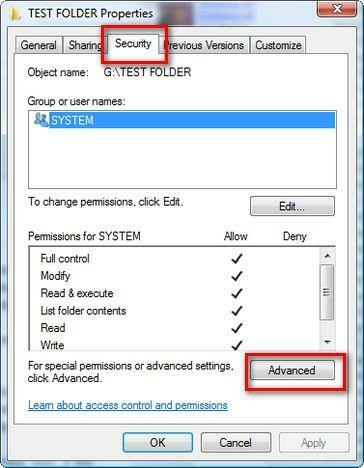 When you copy to another NTFS drive, or within the same drive, any old NTFS permissions assigned specifically to the original are stripped away, and it inherits NTFS permissions from the new location. In order to copy, you must have Write permission for the destination. The user doing the copying becomes the CREATOR OWNER of the copy. if i continue it goes to the next file saying its also denied and so on..
im running dual boot, with xp i might of changed something from there. and when i come back to vista boot acess is denied. is there a way to restore fulll controll to default settings? Would you believe I still cant access the folder after all that? And I thought it would work too. It hates me, I swear! Create a text file and add ".reg" at the end of it. Cut and paste the following into it, save, right-click and merge. 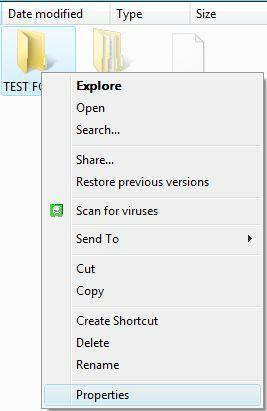 This gives you right click context menu for ownership of anything. if the registry edit is disabled by admin then how it will work???? Followed your directions to a "T" - still can't get permission to copy music to my itunes folder (using Vista). Professionally, my firm owns shares of MSFT - I think I'm going in tomorrow and have us sell it all. Only NTFS File System support this. After I did everything on this guide it didnt work still. however, this guide gave me permision to copy the folder. after that I had a second Drive so i just copy the folder to the other drive and I had access to all my files again, then I just copy the folder back to its original location and everything is good now. please spend some time on this!!!!!!! I have the same problem, I followed the same procedure for the entire folder has <25 files. for 10 files i am able to open it but remaining files i am not able to open. Error: "Access denied 'FileName'.This Document is read only or Encrypted". 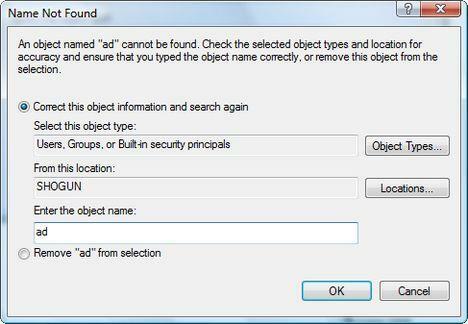 Then Right Click--> Properties-->deselected Read only options and followed the above procedure again. But still showing the same error. Guys please helpme on this it would be very helpfull for me. I have very important have in that files. Tried all the above suggested procedures and still can't restore the backup files (by procedures in "Control Panel" of Vista) from my notebook which runs Vista and is broken. thanks dude. your a baller but, what i was actually looking for was how to take FULL control of a file. one of my icons has the administrator emblem on top of the lower right hand portion of the icon and i any time i do anything it makes me ask permission first. is there any way to take that little emblem off so i can have full control? this problem keep showing on the output. what do i do? I am trying to install a usb driven device called the Tornado that allows you to share files between your own computers. My comupter accepts it, but when I double click to open it up I get this message..."Windows cannot access the specified drive,path or file. You may not have the appropriate permissions to access the item." My other two computers are working great, but I have one that will not let me in. I have tried everything I can think of to change the permission rights but nothing is working. Do you have a suggestion please? This is the first time I have come up against this so im not very familiar with the procedure. I have the same issue in that I moved a folder and it contents to a san connected to a 2008 server and one user had no issue and see the files and can save and modify. the other user who has the same rights cannot save or modify any file in any of the folders. I removed the inheritance and set both users up as owners and gave both full control of the whole tree and this user still cannot modify any file in this directory structure. Vista, the Windows ME of this century. How can I change the setting on my Wife'spc to display her name i.e. "Document printing for Lisa" instead of my name? Nobody seems to have the answer so here I am asking the "experts'. Thanks! I followed all the above and the folders still have padlocks on. I think I didi everything suggested - I have a folder that says it is empty but there are two files there accessible by the program that wrote them but otherwise not (I want to back them up and use them on another computer for teaching). I have spend a while on this. What is the purpose of this apart from annoying users? Great pictures really you won't missed the guidelines However, it didn't wotk for me. I always get meassage of access denied to any of my files from my hard drive C. I did follow step by step above but when I click security tab, a message appear that I must be an adminstrative user with permission to view and prompted me to continue. But once I click continue, anothe message would appeared "can't open access cntrol editor. Access denied. Please help I spend whole day to fix this but of no avail. I typed Administrator and "my user name" where instructed above. Got an error message, but apparently it worked because I can access all my files now.